Free from gluten, wheat, dairy, egg, hydrogenated fats. 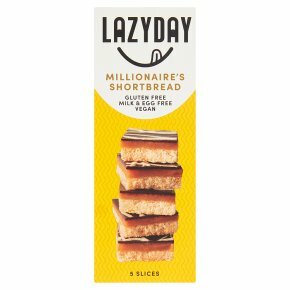 Suitable for coeliacs & vegans.Lazy day millionaire's shortbread, free from but full of taste. Golden caramel spread thickly on a shortbread base and topped with a crisp layer of Belgian dark chocolate. Gluten, wheat, dairy and egg free.